How do I support my argument? 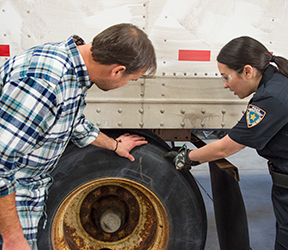 You can challenge any roadside inspection once you know the details of the inspection, including the roadside inspection number, inspection location, vehicle plate numbers, and driver name. In situations where the inspection is not yours, you would have seen the inspection in your FMCSA Portal account or in your CSA BASIC data. Either of these locations should provide the necessary details on the inspection. With that information in hand, you can either request a copy of the roadside inspection report in DataQs or immediately file a DataQs request for review on the grounds that the roadside inspection belongs to another carrier. If you use owner-operators, a list of all owner-operators who were under lease at the time of the inspection. If, after looking at the details of the roadside inspection, you discover that the vehicle was one that had been leased on but had left the company (and obviously the company markings were not removed), supporting documentation should include documentation showing when the lease was terminated.